What is Active Release Technique (A.R.T)? Active Release Technique is a movement based treatment used to diagnose soft-tissue injuries caused by scaring. When an injury occurs to a muscle, tendon, or ligament, it tends to become tight and inflamed. A repair cycle begins to take place, allowing the injured tissue to heal. During the initial stages, friction and inflammation around the injured area increase to protect from further injury. This causes the area to swell, constricting normal blood flow. The body’s natural response to this inflammation is reduced circulation, fibrosis (scar tissue formation) and resulting muscular adhesions (tissues glued together). 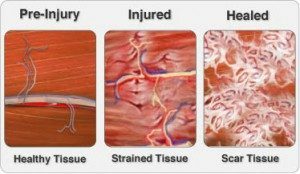 This fibrosis process (scar tissue formation) can result in muscular adhesions that “glue” the muscle fibers together with the surrounding structures. This leads to pain and improper function due to the tissues being “stuck.” Under optimal healing conditions, the repaired tissue will be approximately 70 percent as strong as un-injured tissues. Over time, repetitive injuries cause muscles to become tight, leathery, and bound-up with a higher probability to injure again. Repetitive strain injuries are often characterized by pain that comes and goes, with each flare-up a little more painful than the previous. Thus, the cycle continues. Most people seek help for their conditions by choosing just one type of treatment option. Physical therapy, massage, anti-inflammatory meds, and chiropractic care are typical choices. Sometimes complicated conditions don’t resolve and treatment becomes expensive and ineffective. At some point, patients may feel frustrated and opt for doctors to perform surgery, with potential minimal results and months of rehab. Often times, a combination of treatments are needed to address the specific types of tissues injured to eliminate the need for evasive surgeries when possible. As scar tissue builds up, muscles become shorter and weaker, tension on tendons causes tendonitis, and nerves can become trapped. This can cause reduced range of motion, loss of strength, and pain. If a nerve is trapped, you may also feel tingling, numbness, and weakness. How does an Active Release Technique (A.R.T.) treatment work? Every Active Release Technique session is actually a combination of examination and treatment. The A.R.T provider uses his or her hands to evaluate the texture, tightness, and movement of muscles, fascia, tendons, ligaments, and nerves to determine how they are interacting with the surrounding tissues. Abnormal tissues are treated by combining precisely directed tension with very specific patient movements. This allows your doctor to physically break the adhesion and improve range of motion and strength. These treatment protocols – over 500 specific moves – are unique to Active Release Technique therapy. They allow providers to identify and correct the specific problems that are affecting each individual patient by being direct and accurate in working with your anatomy. A.R.T. is not a cookie-cutter approach and allows for specific identification of the structures involved with your condition. Founded in 1988, A.R.T has been developed, refined, and patented by P. Michael Leahy, DC, CCSP. Dr. Leahy noticed that his patients’ symptoms seemed to be related to changes in their soft tissue that could be felt by hand. By observing how muscles, fascia, tendons, ligaments, and nerves responded to different types of work, Dr. Leahy was able to consistently resolve over 90 percent of his patients’ problems. He currently is a staff member for the Denver Broncos healthcare team and teaches certification courses to health care providers all over the world to empower them to use A.R.T. with their patients. Near Denver and interested in learning more about how active release technique can relieve muscle pain? Contact us today or book an appointment!